The adventures of a road show warrior featuring Bob Carroll. Whether you do school shows or travel around the country performing, this will make you laugh and think about your performances in a new way. Bob has performed for over 40 years doing amusement parks and school shows with his comedy magic and ventriloquist act. This started out as a lecture for magicians and turned into a journey about Bob's adventures and career. This is a story for all those entertainers who refuse to give up but never get to be famous! There are thousands of acts right now touring the country that are talented and hard working. This is just one story about the unknown career of Bob Carroll. If you are a clown, ventriloquist, juggler or magician, there are tips to make your school shows more fun! Valuable tips and secrets that you can use to help your shows. Bob also shares several comedy magic routines for magicians who do birthday parties, school shows or family events. Find out why Long John Silver's restaurant scares Bob to this day! Journey on the tour called "Bob's Not So Excellent Adventure" and learn magic routines that can make you think about the way you do school shows. Read about his Guinness Book of World Record Joke Telling event. Find out how Bob started out in amusement parks, strip clubs and eventually toured doing school shows for over 25 years. There is also a tribute to some of the performers that Bob has worked with over the course of his career. "This book was great. It's actually an Oreo Cookie of a book, and as much fun. The opening and closing chapters are colorful "stories of the road", from a performer who's been a magician, ventriloquist, clown, DJ, strip show m.c., close up performer, Vegas act, resort act, and amusement park act. The stories are as wild and wacky as the business of show business. The middle of the book is all about school shows, kids audiences, and how to navigate and survive them. If you're a variety performer, you'll like the outer ends best. If you are, or ever want to be a school show performer, you'll NEED the middle part most. Let me repeat - NEED! There is more good performing advice and more good tips for doing school shows there than I've ever seen in one place, at one time, ever! You'll get thousands of dollars worth of advice from a seasoned performer who's done it all, and isn't stingy about sharing his experiences. I, for one, am glad I got it!" "As a fellow entertainer I can relate to these stories and I was more than entertained by this book. I was nearly thrown out of a doctors waiting room as I was reading and got laughing really loud and I had to go outside for a minute to calm down. It is a very, very funny book. These are real life situations that would make a great movie! I haven't seen a movie in years that was half as funny as the tales he tells here." "A compilation of great stories and great advice to anyone interested in performing or just learning about it. I've read many books about the entertainment industry but never anything like this! A compelling book that not only gives you a view into the hilarious experiences of one man but also provides some insight into just how complicated and down right difficult it must be to do this for a living." "Having seen Bob perform many years ago at Gaslight Village in Upstate New York, I had to buy the book. After starting to read it, the only reason I put it down was to wipe the tears from my eyes from laughing so hard. Fun and entertaining read from a fun and entertaining entertainer!" 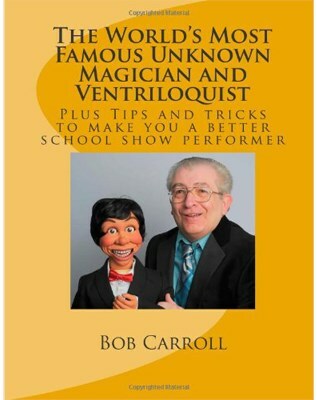 "I recently purchased this book by magician/ventriloquist Bob Carroll and it was one of those books you start reading and you can't put it down until you have reached the end of the last page."